Last time, I talked about knitting acronyms and elaborated on some of my UFOs (UnFinished Objects). But today, I’m going to do the happy dance and share an FO (Finished Object) with you. I’m not certain whether this really qualifies as a finished object because it is just a single sock, and I have another one to complete before the project is finished. But, hey, a finished sock deserves a happy dance, so I’m counting it as an FO. 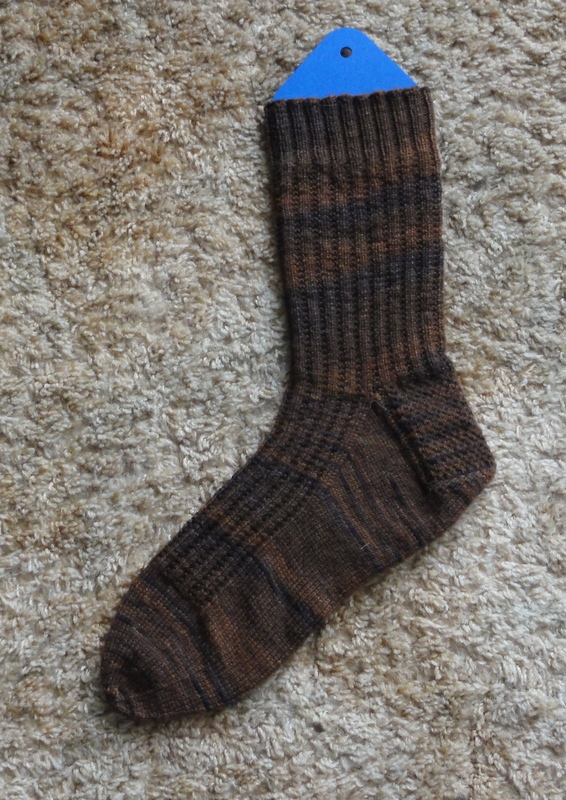 The current man-sock project, a pair of garter rib socks in a lovely Knit Picks Stroll Tonal in the Kindling colorway, is a little more than half-way finished. Sock #1 was finally completed last night, but not without a battle. The first time I finished the sock, I had the DH try it on before finishing off the toe, just to make sure it would fit. Alas, the sock was about an inch too long. No big deal, really. Just rip back and reknit the toe. Toes don’t take long to knit. I can easily complete a toe during a hockey game. So, I ripped out the toe and ripped the foot of the sock back about an inch. The next night I reknit the toe while watching hockey. Being a cautious knitter, having learned some lessons the hard way, I once again had the DH try on the sock before finishing it off. I was certain it would be a perfect fit. I couldn’t have been more wrong. The darned thing was still too long. So, once again, I ripped out the toe, ripped back some more of the foot, and set the sock aside for the next night’s hockey viewing. So, last night, while I watched the New Jersey Devils deliciously destroy the hated Philadelphia F%^ers in the second round of the Stanley Cup playoffs, I once again knitted the toe. And once again I had the DH try the sock on before finishing it off. Happy, happy! Joy, joy! to quote Ren and Stimpy. Like Cinderella and the glass slipper after the ball, the sock fit! I gathered up the live stitches, fastened them off, wove in the ends, and voilà! Take that, sock! You think you can defeat Pinko Knitter? Why, projects far more difficult than you have tried to get the better of me and cried “Uncle!” in defeat. There’s no project the great Pinko Knitter can’t handle. Except EZ’s Adult Surprise Jacket. But that’s a battle that isn’t worth fighting. I’m happy with the way this colorway knitted up. Although there is a little spiraling when worked over 80 stitches, it isn’t unattractive. And the yarn is very soft and cushy. The important thing is that the DH loves it, so sock #2 is already OTN (On The Needles). This entry was posted in Knitting, Socks and tagged hand knitted socks, Knit Picks Stroll sock yarn, knitting and hockey, knitting socks for men, stanley cup playoffs. Bookmark the permalink.